What Is a Composting Toilet Anyway? How Do Self-Contained Toilets Work? According to composting toilet reviews, these are three best models on the market right now. So, let’s take a look at what they have to offer. The Nature's Head composting toilet is our #1 pick and the best composting toilet if you’re looking for a dry compost system. This means that there is a separate container for liquid waste, making it completely safe for you and your environment. Also, since there will be no water in the compost, you won’t have to worry about leaking and that awful odor. Because there is no odor, you will have to empty the chamber once in a month or so. Another great thing about this unit is that it’s extremely well-built, thus will last you for many years to come. The toilet is simple to install, but , according to reviewers, the vent is a little more complicated. 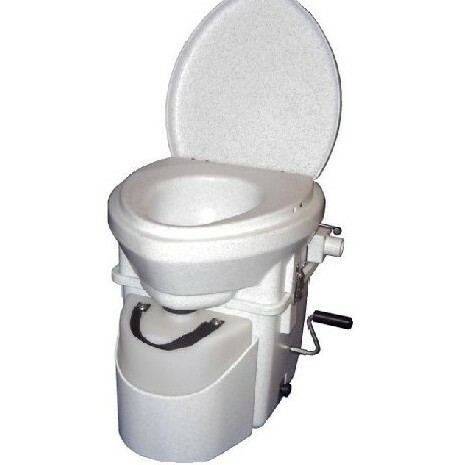 Best of all, the toilet is user-friendly and you will certainly enjoy using it. It is also easy to clean, just keep in mind that you should not use any chemicals when cleaning, otherwise the quality and performance of the toilet could decrease. Also read about our Nature's Head Self-contained Toilet Review. 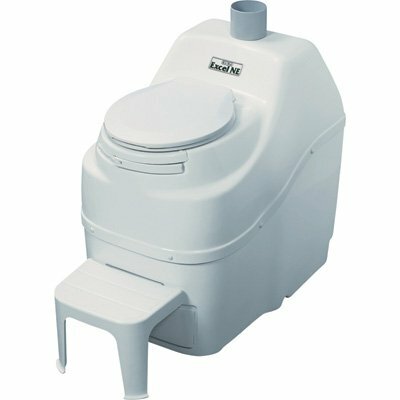 For those looking for a non-electric composting toilet, there is this Sun Mar non-electric composting toilet. Sun-Mar certainly is a recognizable name in the world of composting toilets. Its founder invented the self-contained composting toilet back in 1971. Over the years, their toilets have been upgraded thus it’s no wonder that they are considered some of the best ones on the market. This model is taller than the previous one so it comes with a stepping stool. It is a great choice for occasional use and if you don’t plan to move the toilet. This model offers a higher capacity than many, so it can process lots of compost for your garden. This toilet doesn’t use water and is completely safe for the environment. It is a breeze to install. However, cleaning the unit is a tad complicated task, due to its design. The mold can grow, so you’ll have to deal with cleaning every so often. Also, this model is a bit pricey, considering what you get with it. Last but not least. Here we have one more self-contained composting toilet coming from Sun-Mar. This one is low-profile, making it ideal for small bathrooms. It will add a nice touch to your bathroom, while not taking up a lot of space. It offers less capacity than the second model that we’ve reviewed, but is definitely more portable. The toilet is durable and won’t break. However, there are some negative reviews worth mentioning. Reviewers have had issues with the fiberglass cracking which can lead to a messy situation. Additionally, others state that it is poorly designed and does not work as it should. Be aware of these as a composting toilet is great if it works great. But if not, it can be a real nightmare. First, let us explain the term “composting”. It refers to the process of decomposing organic matter (such as leaves, mulch, and, well, human waste). So, a composting toilet uses no water or very little water in order to turn human waste into valuable fertilizing soil. Hence, the final product is a valuable humus that has high nutrient levels. You can use this humus for your garden and plants, to enhance their health and growth. When a composting toilet is installed properly, decomposition of our waste will be complete. Moreover, there won’t be any odor. In fact, there should be even less smell compared to a traditional toilet. Another benefit of this toilet is that you will save around 7, 000 gallons each year for every person who uses your bathroom. This is significantly more than even the best flushing toilets. Moreover, using this toilet is highly beneficial for our environment. Since the use of water would be drastically reduced, storage and piping impacts will take up less space. As mentioned, composting toilets use the natural process of evaporation and decomposition in order to make human waste re-usable. Now, human waste is 90% water which will evaporate fast and, through the vent system, will be sent back to the atmosphere. Remaining human waste will turn into solid material and will become useful fertilizing soil. Just to point out that, when properly composted, the final product of human waste won’t contain viruses or pathogens, which is why it can be used for nourishing plants and the ground around your trees. When it comes to installation, you can install this toilet wherever you need it. They are mostly used in cabins, cottages, boathouses, trailers garden sheds, and barns. The installation process is fast and easy, as most toilets are DIY installations. The manual is always included, and you can always look for online videos or contact the manufacturer/seller if you’re not sure how to install the unit. So, there you have it – the crucial things you need to know about these remarkable toilets. With all its benefits, it’s not surprising why these toilets are a great solution for off-grid cabins, big households as well as for areas of water shortage. So, why not buy this eco-friendly and highly functional toilet and smartly use human waste? All of the listed products have their own pros and cons, so it’s up to you to pick the one that will suit your needs best.